A team from U.S. EPA is preparing recommendations for "managing or minimizing" earthquakes triggered by oil and gas waste injection wells. But the group appears to have receded from its initial goal of finding ways to "avoid" earthquakes caused by injection. EPA has not publicized its efforts on earthquakes -- the technical term is "induced seismicity" -- but it has discussed efforts with state officials, researchers and interest groups. The document that established the effort, shown to a research panel last year, said EPA's Underground Injection Control program "can and should implement requirements to protect against significant seismic events." This map from EPA Region 6 shows the frequency of earthquakes over time and their proximity to shale plays in the south central United States. Click to enlarge. Image courtesy of EPA. Scientists have known for decades that underground injection of fluid can lubricate faults and unleash earthquakes (Greenwire, Jan. 5). But a series of earthquakes last year near heavy gas drilling areas in Arkansas and Ohio raised concerns to a new level. Also driving that concern is the need for more injection wells all over the country to dispose of wastewater from the numerous oil and gas shale plays being developed. The team, formally known as the Underground Injection Control National Technical Workgroup, is preparing a report to be called the "Draft Report on Injection Induced Seismicity -- Practical Tools for UIC Regulators." An Ohio agency last week described the EPA report as "in press." EPA officials at the agency's Dallas regional office, which is handling the earthquake issue, declined to comment beyond a brief, emailed statement. The statement said, "The EPA is working with states to develop recommendations and best practices to assess impacts to underground storage caused by seismic activity to assist state and EPA UIC programs." The agency email also noted current regulations have "related provisions," including requirements that the zone where waste is injected "must be free of faults/fractures within area of review." Fracturing shale formations such as those found in Arkansas, Pennsylvania and Ohio requires the use of millions of gallons of water, and creates millions of gallons of salty wastewater more toxic than what was initially fired down the hole. Drillers must figure out how to dispose of it. Some reuse part of it in the next "frack job," but they often inject it back underground in a deep disposal well. Nationally, EPA records show there are about 150,000 "Class II" injection wells associated with oil and gas. Underground injection is also used to dispose of radioactive waste, hazardous waste and mining fluids. There are about 500,000 other types of injection wells that dispose of nonhazardous waste. More "earth-friendly" procedures, such as geothermal energy production and carbon sequestration, are also known to have set the earth rumbling. The Safe Drinking Water Act empowers EPA to regulate underground injection. But EPA often hands day-to-day regulation of it to states, including Arkansas and Ohio. Last year's earthquakes culminated in a magnitude-4.0 quake near an injection well in Youngstown, Ohio, on New Year's Day. Ohio officials have placed temporary restrictions on injection in the area of the quakes. Arkansas officials have permanently blocked injection wells in a portion of the state. 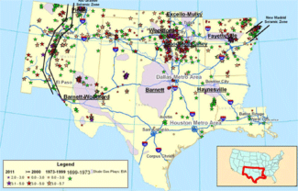 Underground injection of oil and gas wells has also been linked to earthquakes in North Texas, central West Virginia and elsewhere. The EPA study is to examine the quakes in Arkansas, Texas and West Virginia as "case studies." The workgroup effort began quietly in June. Its creation and early work was documented in a Sept. 14 presentation by Philip Dellinger, chief of the Ground Water and UIC Section in EPA Region 6, to a National Academy of Sciences panel studying man-made earthquakes. EnergyWire obtained slides from his presentation through a public records request. The presentation excerpted a 2011 agency memo laying out the work of the UIC workgroup. "Recent reports of injection-induced seismicity have served as a reminder that the UIC program can and should implement requirements to protect against significant seismic events," the memo stated. "In light of the recent earthquakes in Arkansas and Texas, the UIC National Technical Workgroup will develop technical recommendations to inform and enhance strategies for avoiding significant seismicity events." The plan was to partner with state regulators and scientists at the U.S. Geological Survey, and solicit peer review at the end, according to the presentation slides. The presentation also noted that EPA's national study of hydraulic fracturing excludes examination of earthquakes. The study was to have been completed by December, but wasn't. Another staffer from Region 6's Dallas office, Susie McKenzie, provided updates in January to a Houston meeting of the Ground Water Protection Council, an organization of state groundwater and oil and gas regulators. McKenzie told the group that EPA's goal is to "develop technical recommendations that UIC regulators may consider for managing or minimizing significant seismic events" triggered by deep injection, according to slides from her presentation, available online. She also stressed that the "workgroup" developing the recommendations "is not a policy or rulemaking body." The report is to look at whether its recommendations might apply to other types of injection wells and define where more research is needed, her presentation said. The recommendations could include more monitoring of wells and adding permit conditions, according to the presentation. She also noted that a "prompt response" to smaller quakes might minimize bigger ones.